The 3M(TM) Inline Sander and the 3M(TM) Match and Finish Sander generate straight-line finishing on stainless steel and other metals. Easy-to-operate and ergonomically designed, these air-powered tools can be adapted to utilize a variety of abrasive media. 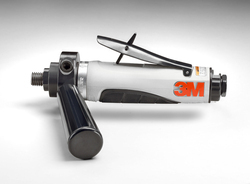 3M™ Inline Sanders are used for generating straight line scratches for finishing stainless steel and other metals. This 1 HP straight shaft sander should be used with rubber slotted expander wheels (PN28348 or PN28349) and 3M™ Coated Abrasive Belts (size 3-1/2 in x 15-1/2 in) or 3M™ Surface Conditioning Belts (size 3 in x 10-11/16 in). Use #3 Wheel Adaptor Kit PN45038 to mount wheel to inline sander.